This Artistic Weavers Calama accent rug is sure to make a statement in any room of your modern home. Complete your home's contemporary design with this indoor rug made of plush wool material. This hand-made rug is durable and modern. This beige tan rug with its geometric pattern is modern and stylish. A neutral beige and soft grey color palette reveals old world inspired designs in The PetProof Natural Harmony Accent Rug, size 2 ft. x 4 ft. Quality crafted of 100% Triexta premium yarn, this timeless accent rug is durable enough for life's toughest challenges. Promising permanent stain resistance against even the hardest to clean stains, this rug is easy to clean with just water or mild detergent. Resilient against fading, matting and crushing, you can count on this Life Proof design to stay newer looking longer even in the busiest areas of your home. The PetProof Sparrow Accent Rug, size 2 ft. x 4 ft., features a space dyed neutral taupe base with an ivory ogee embellished border. Transitional and timeless, this accent rug is quality crafted of 100% Triexta premium yarn. A PetProof design, now featuring the additional stain fighting power of PetProof technology, is proven tough enough to withstand life's messiest moments. Promising permanent stain resistance against even the hardest to clean stains, PetProof designs are worry free. Simply spot clean as needed with just water or with a solution of water and mild detergent. Resilient against fading, matting and crushing, you can count on this rug to stay newer looking longer, even in the busiest areas of your home or office. Featuring a combination of traditional designs arranged in a contemporary patchwork, this transitional rug creates a look that you are sure to love. This piece will instantly update any room in your home with a blend of traditional and modern influences. The rich rusty colour palette is an excellent paring to the emerging trend of reclaimed and recycled furniture pieces. Printed on the same machines that manufacture one of the worlds leading brands of printed carpet, this rug is extremely durable and vibrant. This technology allows the use of multiple colours to create a rug that is wonderfully designed and applicable to any room in your home. Crafted completely in the USA, this rug is made from durable stain resistant nylon. Mayan sunset is a contemporary abstract expression taking colour in a new direction. Impressionistic design in hues of wave blue, sea sand, Caribbean blue, delta green and deep merlot combine to make your room serene. The perfectly designed pattern is sure to garner welcome attention to your floor. Calama Beige Tan 2 ft. x 3 ft. Indoor Contemporary Rectangular Accent Rug This Artistic Weavers Calama accent rug is sure to make a statement in any room of your modern home. Complete your home's contemporary design with this indoor rug made of plush wool material. This hand-made rug is durable and modern. 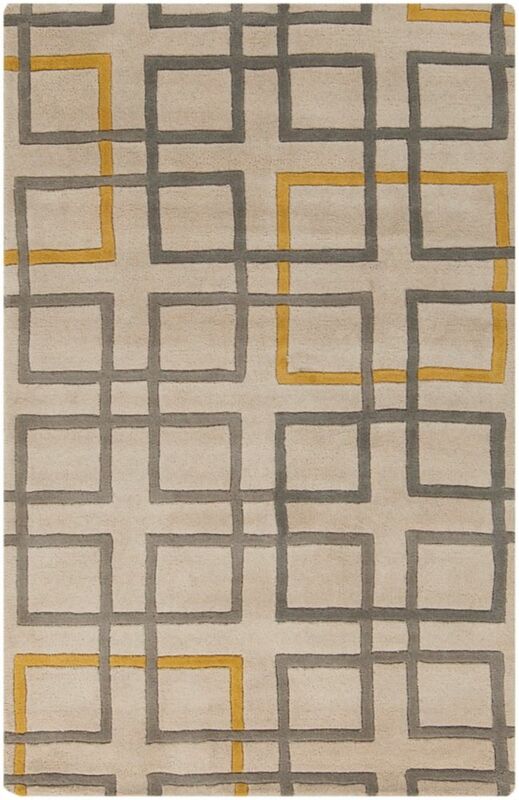 This beige tan rug with its geometric pattern is modern and stylish.